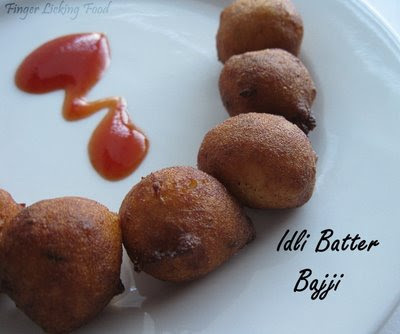 When idli batter turns too sour to make idlis, make bajjis! The more tangy the batter, the better these bajjis taste. I almost always get stuck with overly sour batter and never know what to do with other than Masala idlis or Idli upma. This is another one of mom's creations, and a very good one at that! This makes for a quick snack any day of the week. Combine all the ingredients in a medium bowl. The consistency should be thick and stiff enough to scoop with a spoon (not flowing). Taste and check for seasoning, add more salt if necessary. Heat oil in a deep pan. Scoop the batter with your fingers or with a spoon and drop in hot oil. Fry till golden brown, about 10 seconds on each side. Drain on paper towels and eat with ketchup. That’s it…quick and easy and an excellent way to salvage sour idli batter. Something very new! looks very good..
Wow... looks yummy. Reminds me of Goli bajji!! yumm!! 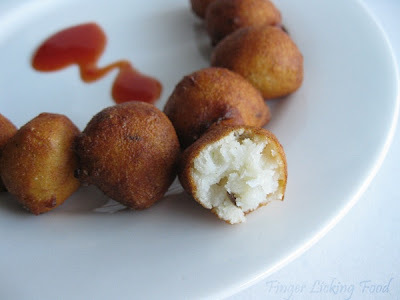 my grandma used to make these from leftover idli batter! hey thanks for sharing this recipe ! i too end up having sour batter, sometimes i make kuli paniyaram ! Wow... snacks looks very yummy and tempting dear. Even we prepare this at home Nams..We even add green chilli paste and finely chopped onions,curry leaves to it..
New to me, nice way of using up left over idli batter!! Wowlov ethe idea of making bajies with the batter. Guess my first time here...nto sure though:).These are perfect to munch in the evenings...we call this "Kunuku".Nice one! Nams that sure looks very tempting! The bajjis look very cute and we do it the same way but without coconut!!! shall try your version!!! It is quick easy and yummy..
Looks wonderful and I aodre the last pic where it shows the inside. woww superb recipes Nams!! :) Jam and icecream looks awesome too!! :) bravo girl!! Thanks Nams.. :) Made this last night. Now, I do know what to do with idli batter gone wrong too :) I don't have to throw it away.